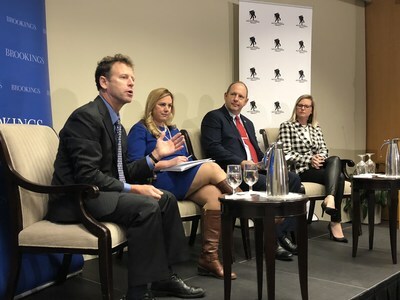 WASHINGTON, Dec. 4, 2018 /PRNewswire/ -- Wounded Warrior Project® (WWP) released the results of its ninth Annual Warrior Survey during a panel discussion hosted by The Brookings Institution. Every year, to learn more about warriors' physical, social, economic, and mental health needs, WWP conducts the nation's largest and most comprehensive survey of veterans who have sustained physical and hidden injuries of these wars. This year marks the survey's ninth issuing and the first time that five-year trends will be released. Michael O'Hanlon, Senior Fellow of Foreign Policy at The Brookings Institution, led the panel discussion, featuring Dr. Melanie Mousseau, Director of Metrics at WWP; Dr. Kieta Franklin, National Director of Suicide Prevention at the VA; and Mr. Anthony Kurta, Deputy Assistant Secretary of Defense for Military Personnel Policy. The panelists discussed the potential impacts of the survey's findings on both the Department of Defense (DoD) and the VA. Data collected from the survey focused on topics such as injuries, challenges, successes, unemployment, and health care choices, enabling WWP to refine and improve the programs and services it provides. Since Sept. 11, 2001, 3.3 million Americans have served in uniform. As of Nov. 14, 2018, the DoD reports that 6,918 have died and 52,774 service members have been wounded in action, but this is just a fraction of those who are estimated to have been adversely impacted by the longest war in American history. The DoD's own Defense and Veterans Brain Injury Center reports that more 380,000 have sustained traumatic brain injuries. In 2008, RAND estimated nearly 20 percent of military service members who have returned from Iraq and Afghanistan reported symptoms of post-traumatic stress disorder or major depression, and in 2014, that there were an estimated 5.5 million military caregivers of all generations in the United States. The need for services and support continues to grow exponentially even as the numbers of killed and wounded decline, and the public's interest and involvement wanes. "Since 2009, we've used our Annual Warrior Survey to determine the needs of wounded warriors in order to inform our programs," said WWP CEO Lt. Gen. (Ret.) Mike Linnington. "This is the science behind our programming. We do this to ensure we are being good stewards of our donors' dollars – directing their investments to where it's needed most. And in addition to informing internal programs, we use information to help inform legislation and policy at the federal level. Together with our partners at the Department of Defense, the Department of Veteran Affairs, and our colleagues in the veterans service community, we will improve the way we prepare warriors for future wars and improve the support we provide to them when they return home." 62% have a VA rating of at least 80% (58% in 2017). 78% report post-traumatic stress disorder (PTSD) as their main health challenge and are still dealing with these effects. 71% chose a VA medical center as their top place to seek help for mental health concerns. 75% of warriors have healthcare coverage through the VA, up from 59% in 2014. 53% preferred talking to another veteran about their mental health. 47% used prescription medications to treat their mental health. 19% did not seek treatment because they felt they would be considered weak. 19% were concerned that future career plans would be jeopardized. 18% felt they would be stigmatized by peers or family for seeking mental health treatment. 70% of warriors are pursuing bachelor's, master's, or professional / doctorate degrees, while 36% of warriors have earned a bachelor's degree or better (33% in 2017). 60% of warriors are homeowners, compared with 46% in 2014. The warrior unemployment rate is 11% in 2018, compared to 14% in 2014. Non-active duty warrior unemployment rate is 12% currently; 20% in 2014. Prescription medicine usage is down to 47% in 2018, compared with 51% in 2014. PTSD symptoms remain a top challenge for veterans. To help combat this key issue, WWP recently committed to a $160 million investment in Warrior Care Network®, an innovative partnership with four top academic medical centers. This network provides specialized clinical services through two- to three-week intensive outpatient programs that integrate evidence-based treatments, rehabilitative medicine, wellness, nutrition, mindfulness training, and family support with the goal of helping warriors thrive, not just survive. "I strongly believe that suicide prevention must move beyond simply managing a crisis, or being about healthcare," said Linnington. "Through Warrior Care Network and other mental health services provided by Wounded Warrior Project, we've seen what an integrated and comprehensive public health approach can do. We need a multi-pronged approach to treatment: a combination of clinical, non-clinical, and peer-to-peer community-facing efforts that are focused on resilience and prevention. Suicide prevention cannot just be about saving someone's life when they are in crisis; it must be about creating a life worth living." To see the full survey, visit https://www.woundedwarriorproject.org/survey, and to learn more about WWP's advocacy efforts, visit https://wwp.news/Newsroom.